MP406 Moisture Probe rapidly measures the soil moisture by pushing the needles of the sensor into the soil surface or the soil profile in an augered hole. The needles are welded to the body and will not break. MPM160 is especially designed for use with MP406 Moisture Probe. 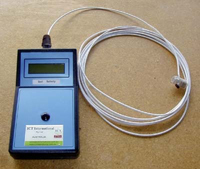 It provides the power to the MP406 Moisture Probe for the reading, display and storage of MP406 measurements. The reading number, mV and Volumetric Soil Water Content (VSW%) are displayed directly. MPExt Rod chrome extension rods are a pair. Each rod is 35 cm long enabling measurement of soil moisture to 70 cm depth in the soil profile. One connects to the MP406 and the other has a "T" handle. MP Case is made of high quality aluminium with strong foam cutout. The case carries the MP406, MPM160 and MPExt Rod. MP Auger Set (optional) consists of a spiral drill bit and T handle. The auger set drills a 50 mm diameter hole enabling the MP406 to be easily pushed to the depth required for measurement. This auger is 1 m long and 50 mm wide. Designed for quick and easy measuring. Monitor and record soil moisture accurately with TDR technology and Spectrum's GPS-compatible data logging equipment, Records 3,250 measurements.